Asking Alexandria is currently out supporting their recent self titled album release on The Resurrection tour along with Crown The Empire and Black Veil Brides. 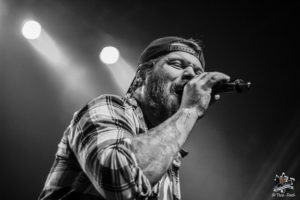 The band recently made a stop in Baltimore Maryland at Rams Head Live where fans were out in full force to show their love for the band. Opening the night was Crown The Empire. With their 2016 release Retrograde being a huge success the band has truly taken off over the past few years. They played their hits “Zero” and “Hologram” as well as “Memories of A Broken Heart”. Frontman Andy Leo is non stop on stage and engaging the crowd. Their set was a perfect start to the night. Asking Alexandria is truly larger than life on stage. Every member of the band has their own stage personality and they all have a ton of fun while performing. Their setlist was a really good combination of old and new material which really got the crowd going. 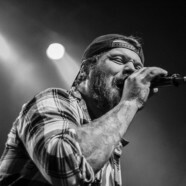 It’s also notable that the band played an encore of their song “Moving On” where frontman Danny Worsnop opened the song playing acoustic guitar. I’ve seen Asking Alexandria a few times over the years and this was the best set I’ve seen from them yet. The chemistry between band members seemed a lot better and the crowd loved it. This tour is a lot of fun all around and wraps up March 2nd in Las Vegas.